Buzz Aldrin and Nigel Henbest. Retired US astronaut and second man on the Moon, Edwin Eugene 'Buzz' Aldrin (born 1930). Aldrin was the lunar module pilot for the Apollo 11 mission (the spaceflight that landed the first two humans on the Moon) and was the second person to walk on the lunar surface, doing so on 21st July 1969 with Neil Armstrong. 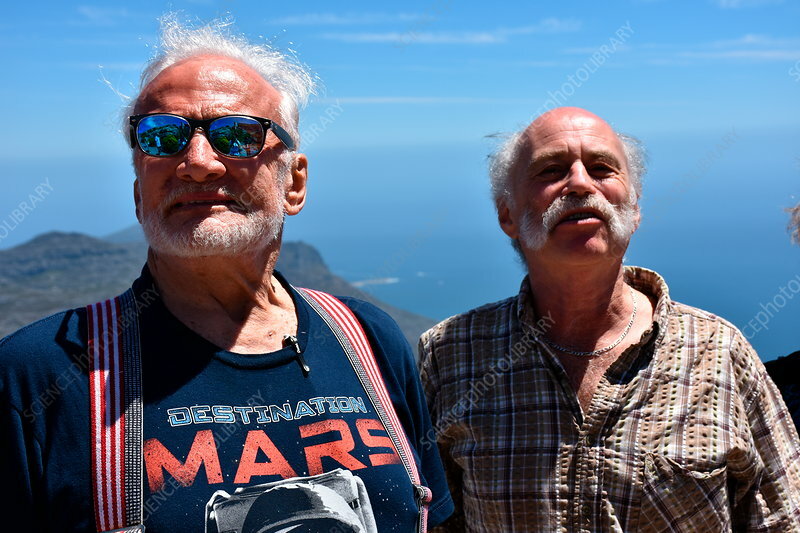 Here, he is seen with British astronomer and science writer Nigel Henbest (born 1951) on Table Mountain, Cape Town, South Africa, at the start of their journey to the South Pole. At the age of 86, Aldrin is the oldest person to reach the South Pole (as of 2017). Photographed in November 2016.